Daisy Giordano and her older sisters Rose and Poppy have just returned home from vacation in Italy the summer after Daisy's junior year. Their psychic mother has stayed behind to work on an important case and is unavailable to help solve a big mystery here in Nightshade, the quirky little town where the Giordanos live in Northern California. Doppelgängers of local residents are appearing all over the place, a fact the girls hesitate to mention to their mother because one of the mysterious doubles appears to be their long-lost father. Their mother has never stopped trying to find him for the past six years, and Daisy and her sisters don't want to get their mother's hopes up about him until they are 100% sure that the man who looks and acts like their dad--at least some of the time--is really him. But figuring out the truth is made doubly hard because they are prejudiced in favor of the man due to their desperate longing that he might truly be their beloved father. Fortunately, they have working in their favor Rose's ESP, Poppy's telekinesis, and Daisy's ability to do both those things, as well. On top of this pressing family problem, Daisy is confounded by the fact that a big portion of the players on the high school football team--including her hunky boyfriend Ryan--have bulked up massively in just the three short weeks Daisy has been in Europe. This seems physically impossible, and Daisy is determined to get to the bottom of this mystery, too, while simultaneously attempting, along with her two sisters, to make a little money at a summer job. Rose is working for an eccentric scientist at a secret lab at the local university, Poppy is running a concession stand at the beach, and Daisy is cooking and waiting tables at the local diner. The fact that her boss is permanently invisible and his juke box is enchanted doesn't phase Daisy a bit compared to the many other problems facing her during the weirdest summer on record. 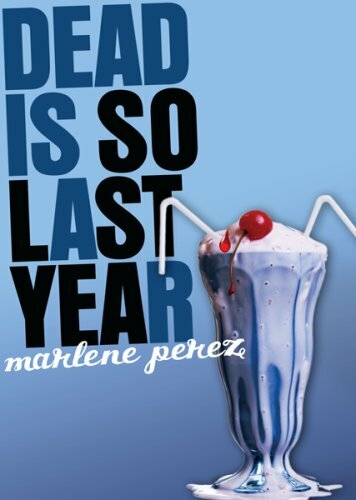 This book is another big hit for Marlene Perez, in her wonderful "Dead Is" series. Daisy is as unstoppable as ever, and the kooky characters in her town alternate between being spooky, scary and downright hilarious, including, besides her boss, the juke box, and the sugar-snarfing doppelgängers, a powerful witch and assorted werewolves and vampires. This book is the third of five books, which are best enjoyed in order. Book 1 is Dead Is the New Black. Book 2 is Dead is a State of Mind. Book 4 is Dead Is Just a Rumor. Book 5, the final book in the series, is Dead Is Not an Option. I highly recommend this book to anyone who enjoys light, humorous YA fantasy stories with an intriguing mystery plot.